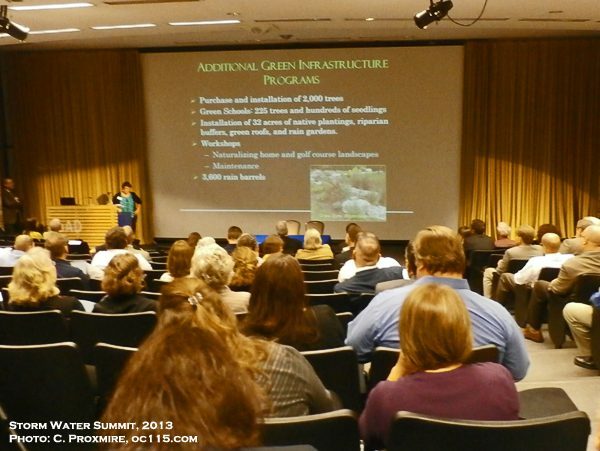 Water resource professionals from throughout the region gathered in Southfield for the first Regional Storm Water Summit, hosted by Oakland County Water Resources Commissioner Jim Nash, Pure Oakland Water and Lawrence Tech. University. In addition to learning about funding approaches, storm water best practices, various regulations and overflow management, participants had plenty of opportunity to learn about the ever-evolving practice of using green infrastructure to control run off. James Smullen, Senior Vice President of CDM Smith and nationally-recognized expert on storm water management shared the benefits of green infrastructure. “The TBL – the triple bottom line is the most important thing because all citizens benefit,” he said. He emphasized perks like ecological benefits, recreation, heat stress mortality, energy savings, air quality, reduced carbon footprint, aesthetics, green collar jobs, and increased property values. “The paradigm shift has an emphasis on infiltration and evaportranspotation over decentralized storage and treatment,” he said. Meaning that instead of just collecting and diverting storm water, the emphasis is on providing permeable spaces where the water can soak naturally into the ground with enough retention so as not to flood basements. Traditional lawns get easily overwhelmed with water, whereas rain gardens and other plants do a better job of soaking up and storing it. Soils vary in their ability to retain water as well, with sand, mulch and compost acting more sponge-like and clay being more of a barrier. Some recognizable implementations of green infrastructure can include greenscaping, trees, rain gardens, green alleys, stream bank restoration and permeable (porous) pavement. Small changes can add up and reduce the risk of flooding during heavy rains, and larger-scale projects can save communities from major flooding issues. Smullen has been working with the City of Philadelphia to improve their storm water system. One revelation he had was that areas where there had been streams in the past had a higher than normal ability to retain storm water without it getting into wells or basements. 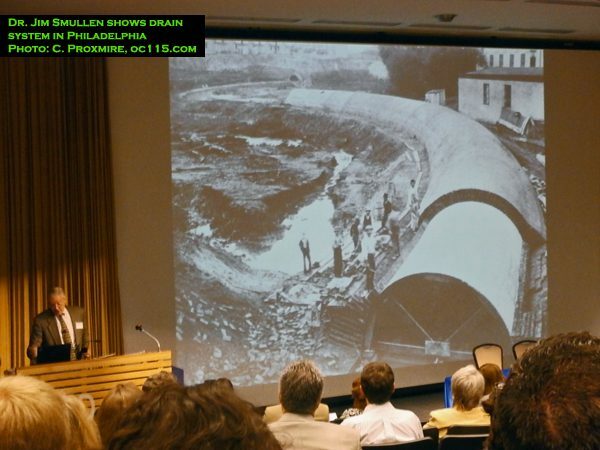 He explained that in Philadelphia when the sewer was built they encased an existing stream into their drain system, and smaller streams were buried. The land was basically leveled and filled in to create the city. An old map of the stream system was found, and their experiments have found that those areas are best for infiltration, with sediment soaking up more water and providing natural filtration. Knowing where old stream beds are in other cities could help in planning more efficient, natural drainage projects. Another victory is that doing small projects can help the public take an interest in green infrastructure. “In Philly we’re replacing basketball courts with porous pavement and allowing the drainage underneath to go to plants around the edge,” he said. “Now we could just make the courts slope that run off goes to the edges, but doing it this way lets us show off how it all works.” It also means that after a rain, the court is dry enough to play on again quickly. Plus the kids like the funny sound the ball makes when they dribble it on the porous surface, he added. There is some resistance to green infrastructure though. “A big problem is there is already inertia in organizations based on how they have done things in the past,” Smullen said. Often old municipal codes stand in the way of progress. Throughout the presentations there were some in the audience who questioned the cost, the value and the complexity of green initiatives. Smullen explained that though things like permeable pavement and greenscaping may cost more up front than typical cement and lawns, looking at the TBL benefits makes it a dollar for dollar match. 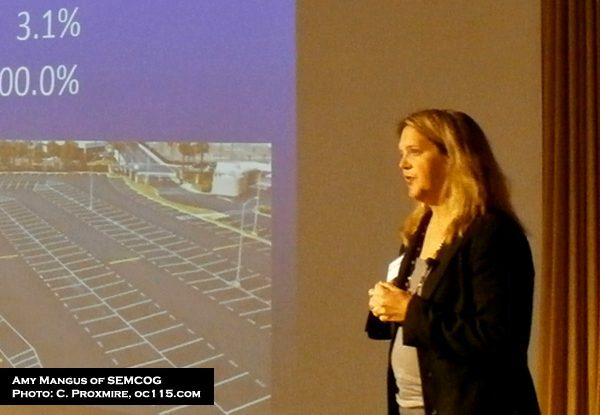 Amy Mangus, a planner with the Southeast Michigan Council of Governments (SEMCOG) said long term benefits can be enjoyed by maintenance departments that make the change. “Instead of having a vacant lot that is mowed every few weeks, can we look at long-term green areas,” she said. There is, however, a period of time when caring for natural spaces takes learning and patience. The “paradigm shift” is happening partially with the help of grant money and test projects that take place in communities. “As more and more [projects] become successful, more and more leaders will step up,” Mangus said. Throughout SE Michigan, SEMCOG has identified places where green infrastructure can have an impact. A study of their multi-county coverage area gives the breakdown of what environments currently exist. Data on the SEMCOG website can be filtered for specific communities. On the whole, SE Michigan is 33.5% covered with trees, 48.5% open areas, 3.1% water, 1% bare and 13.9% impervious materials, such as parking lots and buildings. Of the impervious cover, 35% roads, 25% is buildings, and 40% includes parking lots and other features. Roadways are a major factor in storm water management. “Roads make up a huge area of impervious area, so what can we look at in terms of roads?” Some solutions SEMCOG explores are road diets, redirecting runoff to vacant property, and road re-purposing in high vacancy area. Roadside wildlife areas are another popular solution that is being taken up throughout SE Michigan. One of the many resources SEMCOG offers is a guidebook called Great Lakes Green Streets Guidebook, available at http://www.semcog.org/uploadedFiles/Programs_and_Projects/Water/Stormwater/GLGI%20Guidebook_web.pdf. Funding is a lways an issue with new projects, and when times are tough it’s hard to convince residents to fund drainage systems when water bills and water quality tend to be more compelling causes. In Ann Arbor city leaders took the approach of setting up a separate fund for their sewer system, and a rate structure that takes into account the amount of impervious material on each property. This incentivizes property owners to consider greening their spaces. Harry Sheehan, Environmental Manager of Washtenaw County Water Resources shared data on how green infrastructure has improved water quality in the area. He also discussed how the city was able to get more grant money because of the stability in the sewer fund. “We give people a tax break when they put in rain gardens and make other improvements,” Sheehan said. “It’s made a difference.” The city and county do educational outreach on storm water, water quality and the importance of green improvements. This helps residents understand their bills better, and helps them get involved in making the system better. Every three years, aerial photography is done to map the landscape, letting city officials know what space is impermeable or not. To learn more about Ann Arbor’s approach to sewer funding, visit their water department website at http://www.a2gov.org/government/publicservices/systems_planning/waterresources/Stormwater/Pages/StormWaterRates.aspx. The Summit attracted over 200 professionals from around SE Michigan, and got them considering new ideas to bring back to their communities. 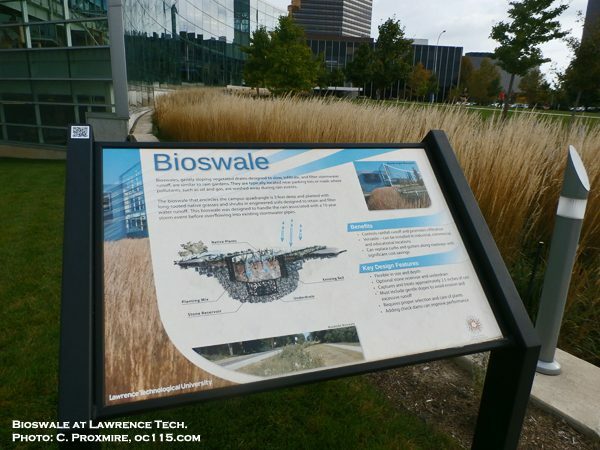 It was held on the campus of Lawerence Tech, where green infrastructure is a big part of the environment. Parts of campus are paved with porous brick. 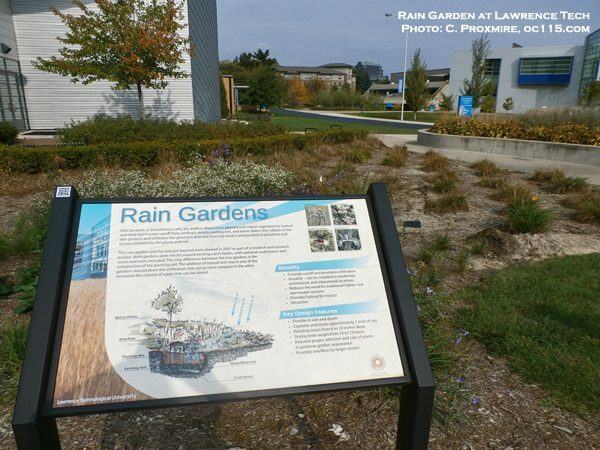 Rain gardens are labeled and studied. Vegetated roofs provide energy savings and water management. And riparian buffer zones, wild areas that filter water before it reaches drains, help slow water flow and clean it naturally. To learn more about Lawrence Tech. visit http://www.ltu.edu. For more on Oakland County Water Resources, visit http://www.oakgov.com/water/Pages/default.aspx. For more on Pure Oakland Water like them on Facebook at https://www.facebook.com/pages/Pure-Oakland-Water-POW/464126110348905.